Central Florida's Residential Roofing Experts! The residential experts at Orange County Roofing can help you choose the correct roofing shingles for your roof style. Roofing shingles come in a variety of different thicknesses, styles, designs and manufacturer warranties. Orange County Roofing also provides a 5 year leak warranty on the labor and workmanship of your new roof. Protect your home with the right roofing shingle options from Orange County Roofing! We also install rain gutters and downspouts for further protection of your home. Your roof's quality depends on the type and quality of roofing shingles, preparation work prior to shingle install, and installation process. Orange County Roofing is experienced with all types of residential roofing systems. On average in Florida, the life span of a shingle roof is 12 - 15 years and usually roof problems are discovered after a leak is found or when other serious damage occurs. Serving the Orlando area since 1981. Orange County Roofing is one of the most qualified roofing companies in Central Florida with focus on quality and customer satisfaction which is why we have been in business for three generations. 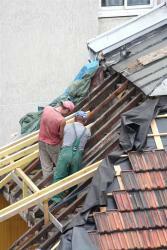 Whatever you roofing needs are Orange County Roofing will provide quality workmanship and provide you with a guarantee!